Cellulose, potassium bicarbonate, modified cellulose gum, modified cellulose, magnesium stearate, soy lecithin and carnauba wax. Take two tablets before each meal. You aren't what you eat, but what you absorb! Digestive enzymes break down carbohydrates, proteins, fats, and other substances in your small intestine so your body can absorb and use all the nutrients you feed it. While other pancreatic products are often diluted with salt or lactose, Mega-Zyme contains full-strength, undiluted pancreatic extract for optimum natural advantages. 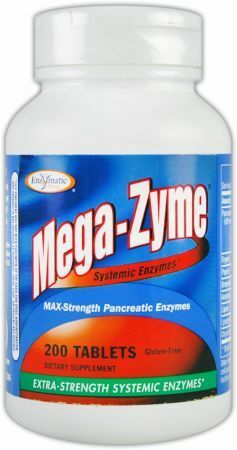 * Mega-Zyme is a unique supplement formula for those who wish to support their diet with natural proteolytic enzymes from both plant and animal sources.